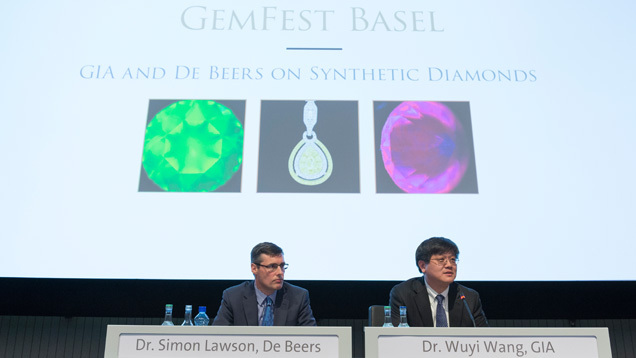 Experts from GIA and De Beers joined together at the March 2015 Baselworld exhibition to assure a concerned diamond and jewelry industry that the means exist to detect and identify all synthetic diamonds, even those as small as .01 carats (ct.). 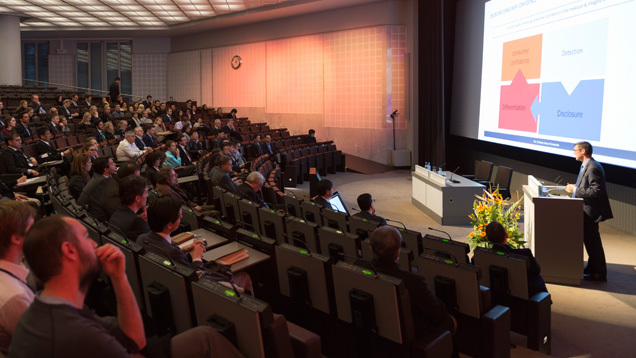 During the GIA-sponsored GemFest, they also detailed research efforts that will enable labs to continue identifying such stones in the future. Dr. Simon Lawson, head of technologies UK for De Beers’ research, and Dr. Wuyi Wang, director of research and development for GIA, discussed the two major types of synthetic diamonds in the market and the technologies used to identify them. They also described devices such as GIA DiamondCheck and De Beers’ Automated Melee Screening (AMS) device, DiamondSure and DiamondView, which are used to identify potentially synthetic diamonds. After Lawson detailed how natural diamonds formed more than 60 miles beneath the Earth’s surface 900 million to 3.5 billion years ago, he and Wang described how High Pressure and High Temperature (HPHT) and Chemical Vapor Deposition (CVD) synthetic diamonds are created in laboratories. HPHT synthetics, which replicate the natural process of diamond formation, were the first synthetics, developed in the 1950s for industrial use. De Beers created its first gem quality synthetic in the 1980s for research. HPHT synthetic diamonds are grown in a press with a chamber in the middle. A seed is placed at the bottom of the chamber, covered in a metal solvent catalyst. Graphite powder is placed above the metal solvent, and then the mixture is subjected to extreme pressure and temperatures of 1300 to 1500 degrees centigrade – somewhat higher than the heat that forms natural diamonds. The different growth conditions between nature and the lab cause HPHT synthetics to form differently, mainly cubo-octahedral versus octahedral or dodecahedral in naturals. The process often leaves telltale metallic inclusions in the stone, some of which may cause it to be attracted to a magnet. These inclusions can be identified visually, though a microscope. Other identifying characteristics include color zoning, particularly around the culet, which is related to the crystal’s growth characteristics, and distinctive greenish fluorescence. Although observation may provide some indication that a diamond is synthetic, devices such as GIA’s DiamondCheck and De Beers’ DiamondSure and DiamondView use spectroanalysis, photoluminescence analysis and/or phosphorescence analysis to more definitively identify stones that are synthetic. Lawson noted that the De Beers-developed DiamondView screening device can pinpoint the signatures of HPHT synthetic’s higher temperature growth and differing crystal structure. In addition, because these synthetics were subjected to high heat for several days instead of millions of years, De Beers’ other screening device, DiamondSure can detect differences in how nitrogen impurities are configured within the stone. Wang added that several new producers are creating higher quality HPHT synthetics, including Fancy blues, colorless and fancy yellow diamonds. The largest fancy color HPHT synthetic GIA has examined to date was larger than 4 carats. A Russian producer, New Diamond Technology, has produced colorless and near-colorless HPHT synthetics as large as 5 carats, Wang noted, displaying a 5.19 ct. K color I1 cut-cornered rectangular shape and a 4.30 ct. D color SI1 cushion shape. The newer synthetic manufacturing process, CVD, has rapidly developed within the last decade. Gasses, usually methane and hydrogen, are heated by microwaves to form a plasma that deposits carbon atoms onto a substrate and crystallizes as diamond. After growth, the synthetic diamonds are sawn into cubes or cylinders. Unlike HPHT synthetics, CVD stones have no distinctive inclusions, so, like HPHT synthetic diamonds, they can be screened out by use of infrared spectroscopy or the DiamondSure, which can detect their telltale absorption features. Definitive identification may then be made by the DiamondView, which reveals CVD diamonds’ distinctive fluorescence patterns. It was also noted that while annealing (high temperature heat treatment) of CVD can remove some characteristic spectroscopic emission lines, a silicon related impurity that is very common in currently available CVD stones (and very rarely found in natural diamonds) is extremely difficult to remove. Because CVD synthetics grow differently from natural diamonds, they show a distinctive striation pattern under magnification and have a distinct orange fluorescence. This color usually changes to green for diamonds that are annealed (heated at very high temperatures) after growth. Wang pointed out that, while today’s market is still dominated by natural diamonds, the number of synthetics is increasing and their quality continues to improve, making disclosure necessary. Gem labs, he said, play a critical role in that disclosure. As an example, he showed CVD synthetic diamonds, ranging from 0.10 to 0.30 carats, produced in 2003 that had a distinctive brown color. Within three years, producers learned to develop near colorless stones, and by 2011, they could obtain near-one-carat weight and near colorless products. Today, some near-colorless CVD’s are as large as 3 carats. Wang also described how CVD producers can create fancy colored diamonds by controlling the levels of nitrogen in the growing process. He showed several examples of lab-grown brownish pink and pink diamonds. He also pointed out that CVD’s from different producers have distinct identification features of their own. Lawson noted that De Beers continually refines its DiamondSure and DiamondView to improve detection capabilities, particularly as synthetic production methods change. The AMS, an automated version of DiamondSure, has been released to enable more economic testing of melee stones down to .01 ct.
Wang said the challenges to identify diamond synthetics can be significant, especially when they are mixed into parcels of melee. He displayed an image of a pendant with 104 very small fancy yellow diamonds, one of which was a synthetic weighing .004 carats. He said GIA’s screening device, GIA DiamondCheck, can flag all potentially synthetic or treated diamond and non-diamond imitations from .01 to 10 carats. DiamondCheck employs spectroscopic analysis to provide rapid screening for colorless and yellow diamonds. The device can effectively screen pink diamonds as well, provided they are boiled in acid first to remove any possible coatings. DiamondCheck also identifies HPHT treated natural diamonds, and non-diamond simulants. DiamondCheck, DiamondSure and AMS are rapid screening devices that flag potentially synthetic diamonds. The DiamondView presents more detailed spectral analyses that require review by a trained technician to determine if the diamonds are natural or synthetic. Both researchers stressed the challenges posed by the continued improvement of synthetic diamonds in size, quality and ability to appear more natural. GIA scientists, more than 40 on staff, have been researching synthetic diamonds since the first gem quality specimens were created in 1971. They also stressed confidence that De Beers and GIA will be able to keep pace with these developments and be able to identify them accurately. “Our research not only deepens the world’s understanding of gems, but protects those who buy or sell them,” Wang concluded. Explore articles that chronicle GIA’s research efforts to understand and identify synthetic diamonds. Research not only deepens the world’s understanding of gems, but also protects those who buy or sell them.